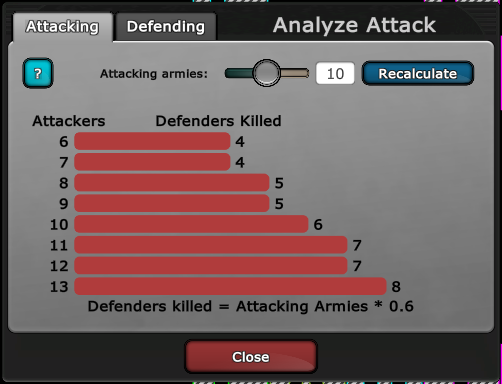 The Analyze Graphs window helps you figure out how many armies you should attack or defend with. To find this window, select Analyze Attack from the game menu, or in a luck game you can click Analyze when making an attack. If the game you're viewing these graphs from uses no-luck combat settings, you'll see the no-luck graph, otherwise you'll see the probability graph. To understand these graphs, you should first understand the combat basics. The first thing you should do after opening the Analyze Attack window is to set the number of armies you expect the defender to have in the text box at the top. Remember, the defender gets a chance to add armies before the attack takes place, so you may wish to predict how many your opponent will add. When attacking neutral, you can be assured the numbers here will be accurate. After changing this number, click the Recalculate button. The no-luck graph only appears in games that have no combat luck (i.e. the luck modifier is set to 0% and the rounding mode is set to straight round). This graph shows you exactly how many armies you need to attack with to capture the territory for several different defending amounts. You can also switch to the Defending tab at the top to see how many armies are killed on defense. This is useful if you're trying to ensure you hold a territory, to see how many armies attackers will lose when attacking you. The probability graph shows you percent chance you have to capture a territory based on how many armies you attack with. In this example, we have entered that the defender has 40 armies. To be 98% sure that we capture a territory that has 40 armies, we look at the graph where the vertical axis reads 98. This corresponds to about 68 armies. You can hover your mouse cursor over each circle on this graph to clarify what that point in the graph means. Both graphs are affected by the offense and defense kill rates set for the game you are looking at. The probability graph is also affected by the luck percentage and rounding mode set for the game. Therefore, you cannot assume that the numbers you see in one game will hold true for another game since the settings may be different. 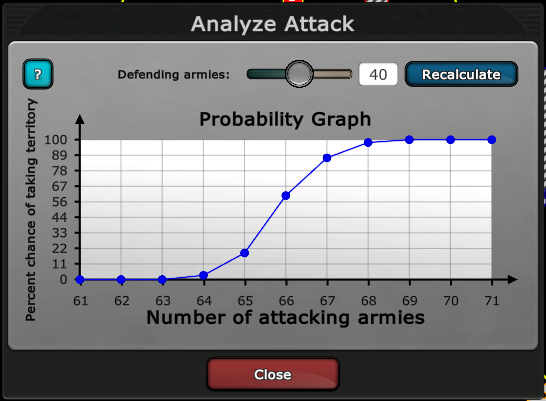 The Probability graph is generated by running the attack thousands of times for each number of attacking armies. Therefore, the numbers could change slightly from one run to the next. However, they are typically only off by one percent at most. Astute players will notice that the probability graph dips a bit where the number of attacking armies equals the number of defending armies. This is most easily seen when the number of defenders is 1 or 2. This is not a glitch and does indeed reflect the true probability. This is due to an edge case in the combat system. If equal numbers fight and both sides kill the maximum number of armies possible, and since every territory must have at least one army, there would be no armies left to control the captured territory. In this event, Warzone simply resurrects one defending army and allows it to retain control of the territory. For this reason, it's rarely a good idea to attack a 1 with 1 or to attack a 2 with 2. This page was last modified on 12 April 2018, at 20:22. This page has been accessed 165,191 times.